Homemade peanut butter is just a few simple steps away. No need to buy overly salted, overly sugared or overly processed peanut butter ever again. Our easy steps will show you just how quickly you can make your own nutritious and dog safe peanut butter. Peanut butter and dogs are a match made in heaven. You'll rarely meet a dog who will turn a nose up to the aromatic treat. Which is a great thing for dog parents who need to give our dogs the occasional medicine. Or, for the active dog who can be slowed down with a smear of peanut butter on a treat filled toy. 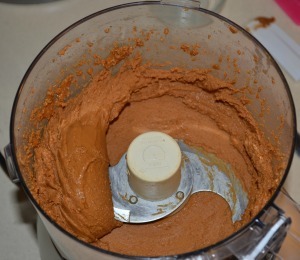 Homemade peanut butter is a fantastic way to get all of the nutritional benefits of peanuts into our dogs. Peanuts have healthy fats, protein, antioxidants, vitamin E and manganese. All of this adds up to a heart healthy treat and a very rewarding homemade dog treat. When you make your own peanut butter you can add additional ingredients that have their own health benefits. This recipe calls for ground flax seed and coconut oil to increase the nutritional value and increase the fiber content. Even if you've never thought of making your own homemade peanut butter, you'll want to try this recipe. This was my first batch of peanut butter, and let me tell you, I won't be buying peanut butter ever again. The fresh roasted flavor, and complete control over ingredients, is enough to make me a believer. I'm sure you'll be the same! Evenly spread peanuts on a baking sheet. Roast the peanuts for 5 minutes. Stir or gently shake the pan to move the peanuts around. Roast for another 5 minutes. Test, roast longer if desired (see note below). Remove the red papery skins. 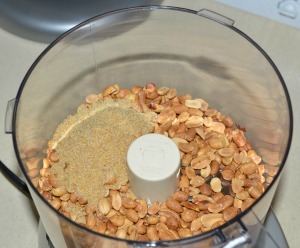 Place the peanuts and the flax seed in a food processor. 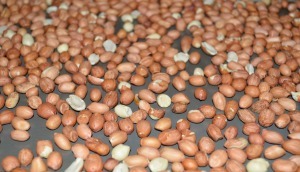 Pulse 10 times to break the peanuts into small pieces. Set a timer for 1 minute. Turn on the food processor and let it run for the full time without interrupting. Repeat steps 10 and 11. 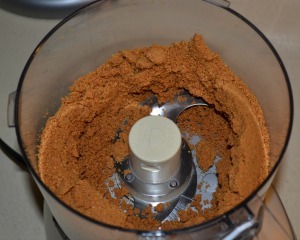 Add the coconut oil to the food processor. Repeat steps 10 and 11 two more times. Test for smoothness (see note below). Once the peanut butter is smooth, scoop it into a sealable container and refrigerate. Storing - Homemade peanut butter lasts about one month in the refrigerator in a sealed container. Yield - About 1 3/4 cup of peanut butter. Roasting Peanuts - The size of the peanuts, the humidity of your home and your own taste preference will determine exactly how long you should roast your peanuts. The recipe calls for roasting your peanuts for 10 minutes because that may be all you need. When you have reached the 10 minute mark, remove one peanut from the baking sheet and let it cool. Remove the paper skin and eat it. Does it taste "roasty" enough for you? If the peanuts still taste raw, return the pan for another 2 minutes. Check every 2 minutes after that until you have reached your desired level of roast. Be careful not to burn the peanuts as they will transfer a brunt taste to your peanut butter. Don't Skip the Roast - You can technically skip the roasting step and make a raw peanut butter. But, it is highly discouraged. The delicious peanut flavor and overwhelming smell comes from the simple step of roasting. When a raw peanut is heated it will begin to release it's tasty oils. 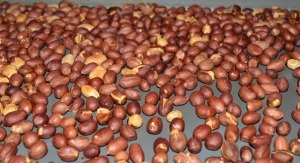 You'll see the raw peanuts start to shine when you roast them at home. If you really want to skip the roasting step you can purchase dry roasted, unsalted peanuts to make your own homemade peanut butter. But, don't underestimate the fresh flavor that roasting at home can accomplish. Removing the Peanut Skin - The best way I've researched to remove the roasted peanut skin is to rub the peanuts in your hands and into a salad spinner. Assuming the holes in your spinner are small enough, you will be able to gently spin the peanuts and the skins will be whisked away from the nuts. There may be a few peanuts that you'll have to manually remove the skin from, but that's an easy task. Take two bowls to a comfy chair, put on a favorite show or movie and have fun while removing the skins. 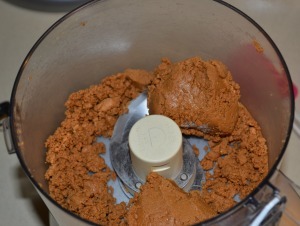 Test for Smooth Peanut Butter - As you run your food processor for it's 1 minute intervals, and then scrape the bowl, it will seem like the peanut "mash" will never make it to "butter". Trust me, it will. Plus, it will make it's transformation very quickly. 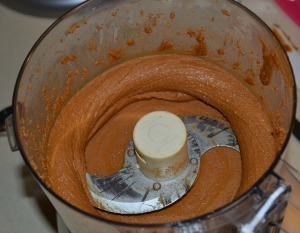 You may notice a change in the sound of your food processor before you notice the texture of the peanut butter. For 4 long minutes it seems like your machine is in protest. Then, all of a sudden the peanuts give up all of their healthy oils and you've got peanut butter. Depending on your machine, the level of humidity and the peanuts that you use, you may need longer than 4 minutes to make peanut butter. 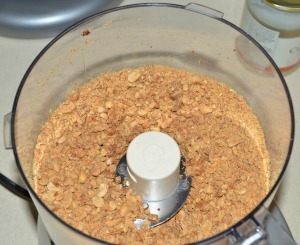 Just continue repeating the 1 minute of timed mixing with through scraping until the peanuts are as smooth as silk. Homemade Peanut Butter for Humans Only - If you want to make peanut butter only for your human family members you can add 1 tsp of sea salt and 1 tsp of raw honey to make it more pleasing to the human palate. 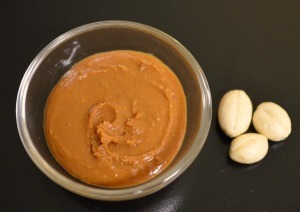 Nuts Not to Use - Do not use macadamia nuts, walnuts or brazil nuts for homemade peanut butter. They have qualities that are not safe for dogs and can lead to upset tummies, diarrhea or worse, death. Your own homemade peanut butter is just a couple of steps away. No longer are you limited to the bland over processed peanut butters on the market today. Make a fresh batch of dog friendly peanut butter so you can make dozens of delicious and healthy peanut butter dog treats. Is there a nut free alternative (such as soynut butter)?